Water damage can strike without warning and can leave your home in a state of disrepair that needs to be restored immediately, which is why our water removal pros at 911 Restoration Chicago are standing by and available 24/7 to send out our mobile crews of water removal experts to stem the flow of your emergency water situation. Our water removal technicians love Evanston and that’s why we make our water damage services available with a free inspection, same day service and we will respond to any call within 45 minutes, because in a water damage emergency timing is crucial to keeping the damage and the costs at a minimum. We are the water damage Evanston experts and we have over 35 years of experience offering top of the line water damage repair and restoration services. Evanston is well known for being a picturesque town used in many movies, that has been the home to many famous people throughout its tenure. Evanston is also one of the early adopters of climate change proposals and joined the United States Conference of Mayors which is a consortium of mayors from around the country committed to activist activities on climate change. The leadership in Evanston knows that climate change and the effects it produces are having an effect on people and communities big and small, including their own right next to Lake Michigan and highly susceptible to flooding and water damage during heavy rain, severe storms or other extreme weather events. And while residents love being forward thinking as members of a committee on climate action, they don’t enjoy the effects of climate taking action in their homes in the form of flooding or other water damage. 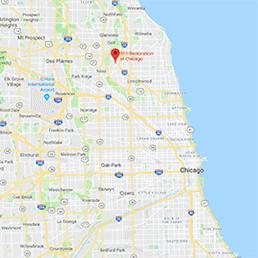 So if you have flooding in your Evanston home, of if you just want to know how much water damage restoration costs, then give our experts at 911 Restoration Chicago a call today! Advanced cutting-edge mold remediation techniques. Our water damage Evanston pros know that water removal may seem like an expensive prospect, but with the right technology and experience our specialists can take care of it quickly and safely for you without cutting corners, and all at the most affordable price possible. Our water damage Evanston experts have over 35 years of experience as the industry leaders in all forms of restorations, and in that time we have learned a few tips and tricks that may help you to prevent a basement flood or any other form of water damage you might incur, so call us now! How Can I Prevent A Basement Flood? Our water damage Evanston pros know that a basement flood is one of the most common forms of water damage that people in the Chicago land area experience and it is usually caused by a pipe burst that our professionals at 911 Restoration Chicago can show you how to prevent through regular maintenance. Basement flooding can seriously damage the structural integrity of your home and can lead to future mold growth. The Insurance Information Institute has data which shows that water damage is the second most frequent loss claim by homeowners, and that means it can happen to anyone even in idyllic Evanston. Our water damage Evanston experts recommend that all homeowners take the following preventative actions to lower their chances of dealing with flood damage. Make sure to perform routine maintenance on your home plumbing. Even small leaks in your plumbing can be a sign of a future pipe burst or ruptured hoses. Make sure to keep a sump pump in your home. Sump pumps can be used to clear a room of standing water fast. If you have a toilet in your basement you may want to install a sewage back flow valve. The valve will prevent toxic sewage from flooding your basement in the result of a toilet overflow. We value professionalism and we utilize only the latest drying technology. So if you have flooding in your basement, or if you just want to be prepared by having the best restoration company in Evanston in your corner, then give our experts at 911 Restoration Chicago a call today! What Is The Best Restoration Company In Evanston? Our water damage Evanston pros have over 35 years of experience as the industry leaders in all forms of restorations, and that in concert with our desire to always put the customer first makes us the best restoration company in Evanston hands down. Our expert technicians always put the customer first and we value professionalism which is why we are licensed, insured and bonded to provide not only excellence in service, but also peace of mind to our clients so they can rest easy knowing that their home restoration is in the best hands in the business. We are also working with all insurance companies to provide our customers with the most affordable price possible for your restoration needs. And we aren’t just the best restoration company because of our decades of knowledge and experience, but also because we truly care about the city of Evanston and all of its wonderful citizens. So if you have water that needs removal in your home, and you’ll settle for nothing less than the best in the business, then give our experts at 911 Restoration a call today!